The Redleg 3 is a tribute to our supporting arms the Artillery Branch of the military. The woodland camouflage blends well with any wooded area and helps keep your camp concealed. 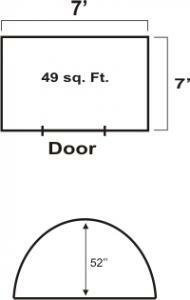 The 52" center height and 49 sq.ft. Of floor space makes this a spacious 2 or a comfortable 3 person tent. The light weight and small pack size makes this tent easy to add to your pack. 2 large windows and large mesh vents help to keep the interior moisture free and the rainfly comes down far enough on the sides to keep rain from blowing under the fly. Pockets are sewn into the walls for small items and a gearloft is included to help keep things off of the floor. A bathtub floor keeps seams up and off the ground and a seam taped rainfly minimizes the seam sealing needed. The tent comes complete with tent, pole and stake bags as well as extra guylines and stakes for windy conditions.